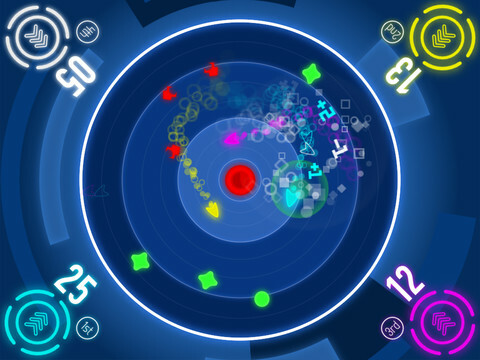 ‘Orbit1’ Review – The Ideal iPad Party Game? Orbit1 [Free] is an incredibly minimalistic game. It doesn’t have Game Center or achievements, it doesn’t have game modes, it doesn’t even have levels. If you have an iPad, though, you’re going to want to pick this baby up. It’s the perfect game for playing around the table with a few friends, and even better — it’s free. Caffeine Monster Software has put together the game I wanted when I first got my iPad. When everyone wanted to take a look and see what cool things I could do with it, this was the cool thing I had in mind. It’s an arena game for one to four players, and it has insanely simple one-touch controls. If you’re ever in a situation where you need a way to kill time with a handful of people without explaining complex rules and controls, this is your game. You spend each round controlling a small ship orbiting a red ball of doom. Each player has a button in a corner of the iPad. Press it to move away from the center, release it to move toward the center. Hit anything red and you die and lose a point. Hit anything green and you gain a point. And, most importantly, smash into the back or side of an opponent and you earn two points and take them out for a second. Whoever has the most points when the 2, 3 or 4 minute timers runs out wins. Sounds simple, no? But that’s the beauty of it. I brought this game out at a dinner with family and everyone could jump in and pick it up in a round or two. There is no deeper game to dive into, but that’s not the niche Orbit1 fills. I’m thinking about lineups at cons right now, and how easily a game like this could break the ice with fellow geeks if you don’t mind having their hands all over your iPad. Or playing with your kids, if you have them. There’s really no barrier to entry here. I’d like to see a few small additions. Minimalistic or not, Game Center leaderboards couldn’t hurt. You can play solo and track your own high score already, but that’s of limited value without an online leaderboard. I also wouldn’t mind seeing a mode that’s even more minimalistic. When you’ve got all manner of red things to dodge and green things to collect, it can be a bit difficult to focus on the real fun: obliterating your opponents. A simpler death match might also ease non-gamers into the experience. But those are just thoughts for improving what is already an excellent experience, one that does exactly what it needs to do. Orbit1 is a cleverly designed ice-breaker, a minimalistic but social time killer. It pulls you into the fun with such conviction that you’ll be hard pressed to find people who can resist. And you know how I mentioned that it’s free? I meant really, truly free. No ads, no in-app purchases. I’m not sure what sort of madness compelled Caffeine Monster Software to be so generous, but don’t waste this chance. If you haven’t got someone to play with, grab Orbit1 and go make new friends. It seems like it might just be good for that.